Its all in the design. How small can an object be and still have value? How can a valuable object be fragmented to the point of destruction—where each individual piece is so small as to be nearly valueless—and yet when collected together with other basically valueless fragments become something completely different—something more valuable? 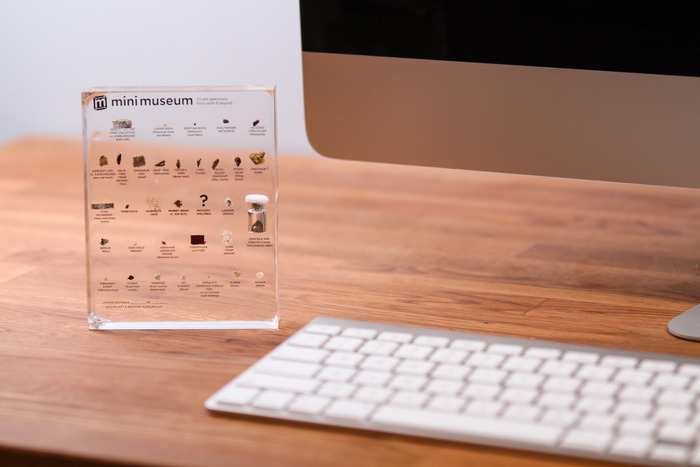 An interesting Kickstarter, The Mini Museum, seems to do exactly this, and offers the opportunity for some brief thoughts on the value of objects and their display. 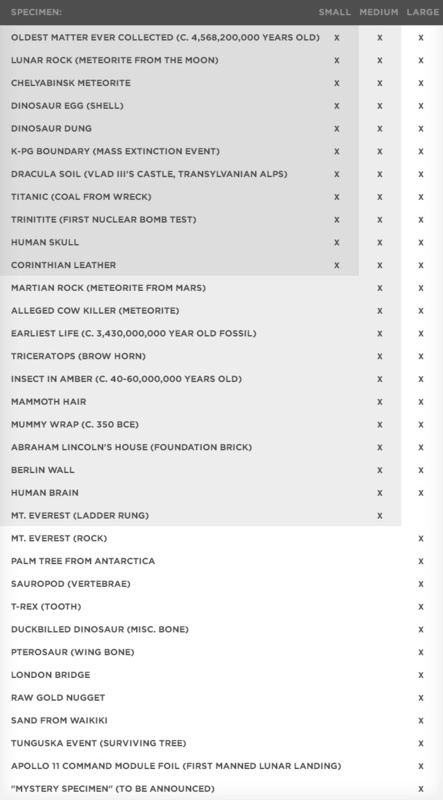 Hans Fex, the museum’s creator has acquired a wide variety of interesting curiosities—some I assume reasonably rare and expensive. He has collected dinosaur fossils, asteroid fragments, mummy wrap, a piece of the Berlin Wall, Dracula soil, and various other artifacts both historical and curious. According to his Kickstarter proposal, he basically plans to destroy each of these objects—reducing them to tiny fragments. The fragments he will then mix together and arrange into a small collection and embed it in clear epoxy, complete with labels. Cousin of the paperweight with a bit of cabinet of curiosity thrown in. A kind of reliquary of miscellany. I was immediately reminded of the wonderful book I read some time ago written by Celeste Olalquiaga, The Artifical Kingdom: A Treasure of the Kitsch Expereince. The resulting “Mini Museum” collection—which Fex describes as “epic” and yet “pocket-sized”—derives much of is power, however, from the same forces at play in “Big Museums.” After all, museums are full of fragments—given meaning through collection, narration and display. The fragmented objects are linked metonymically to their site of imagined origin or historical wholeness through stories and a bit of fantasy. A collection’s fragments do not need to necessarily be large to have value. In fact, their size can be inversely proportional to their value as mementoes—people love small things to inhabit with their imaginations. From “the oldest matter ever collected” to various dinosaur fossil fragments, to “sand from Waikiki” the collection relies on the materiality of the objects, the visibility and inaccessibility of the objects in the epoxy, the stories about the objects, and the magic of the human imagination that animates the entire thing. It is brilliant and the success of the Kickstarter campaign is remarkable. It would be perfect for teaching about objects and value in my museum class. I also just find myself desiring one. A collection at every price point.